Winter is in full force, the air feels crisp as the temperature drops, snow blankets mountains and cities alike, all while a silent killer peruses your home or practice space for guitars to mangle day in and day out. That guitar slayer is humidity and it can turn your precious prized guitar into a mere memory of how it used to sound, feel and play. At Arizona Music Pro we focus on keeping all our guitars in top shape, especially regarding humidity and want to pass that information on to you so you can continue to enjoy your guitars for years to come. How can humidity be so damaging to a guitar anyways? Well, to understand how to protect your guitar it definitely helps to understand what exactly is happening to your instrument first. Humidity is a measurement of how much water vapor is in the air. A guitar is made of extremely porous wood that actually holds water within it. 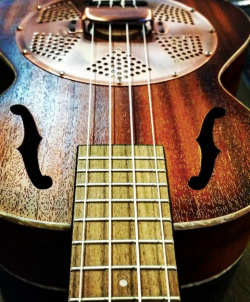 Changes in the air’s humidity can cause your guitar’s wood to lose that water contents becoming too dry because the air vaporizes that water and literally pulls it out of the wood. This leaching of water can cause your fretboard to shrink, making the fret edges stick out and suddenly sharp. It will make your guitar difficult to keep in tune, or the action to change as the neck changes shape. Alternatively, too much humidity can cause your guitar to become too wet or soggy and actually expand as the wood fills with water. It can lose volume, and the tone can diminish, the glue joints can fail or the expansion can cause the finish to crack. Whether too high or too low, If humidity goes unchecked the very worst can happen - structural cracks to the body of your guitar, and these cracks can cost a pretty penny to get repaired and even forever change the tone and feel of your guitar. Preventative measures are the only way to ensure that your prized guitar doesn’t succumb to humidity damage, and luckily with a few tools, some knowledge, and tricks, you can ensure that your guitar will stay in top shape for a lifetime or two. What is the ideal humidity for your guitar and how can you ensure that it stays at that humidity all the time? 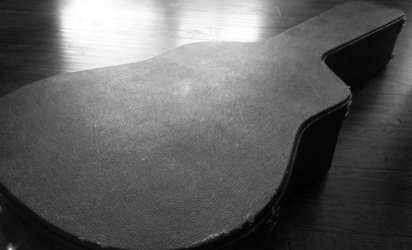 The ideal humidity for your guitar is 45% - 55% relative humidity. Between these percentages your guitar will stay in great shape, retain its wonderful tone and keep the feel and playability that caused you to pick it up in the first place. How can you measure the humidity though? 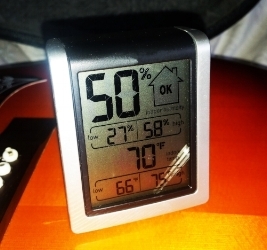 A digital hygrometer inside of your guitar’s case can easily measure and make you aware of any rising or lowering humidity levels. This will ensure that you’re aware of any drastic changes and most even come with a temperature reading that can add additional information to your guitar’s living environment. We recommend a digital hygrometer over analog simply because with today’s tech advancements we feel that a digital hygrometer maintains more accuracy overall. Hygrometers are available at most places that also sell thermometers, and many guitar kits are available that offer both hygrometers and humidifiers. You picked up a hygrometer and now know exactly what your humidity levels are, but in order to control those levels a humidifier is going to be necessary. Luckily these can be picked up in a variety of forms and for a very fair price given just how much insurance they offer your instrument. 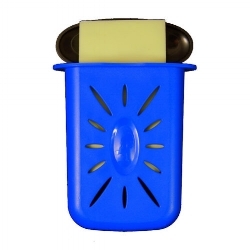 We like soundhole humidifiers because of their ease of use, reusability and price, which is why we recommend Music Nomad’s Soundhole Humidifier, which can be purchased from our online shop or in-store. Keep Your Guitar In A Controlled Environment. The reason you want to keep your hygrometer inside of your guitar case is because it is also where you should be storing your guitar when not in use. While that expensive acoustic may look amazing on your wall as a playable art piece, it’s really best to keep it in its case when not playing because the environment is much more easily controlled and measured, similar to that of a humidor for cigars. Also avoid keeping your instrument in places where the temperature can change drastically, like in the trunk of a car, a non-temperature controlled room or in direct sunlight. By following these easy steps and checking up on your guitar every week or two, especially in the dry Southwest, you’ll ensure that the health of your instrument is ideal and that you won’t succumb to dead frets, constant tuning issues and above all structural damage such as cracks. It’s hard to imagine a better insurance policy for such a treasured piece of gear! Newer PostWIN a BOSS TU-1000 Stage Tuner! Older PostShould I Buy Acoustic Drums or Electronic Drums?